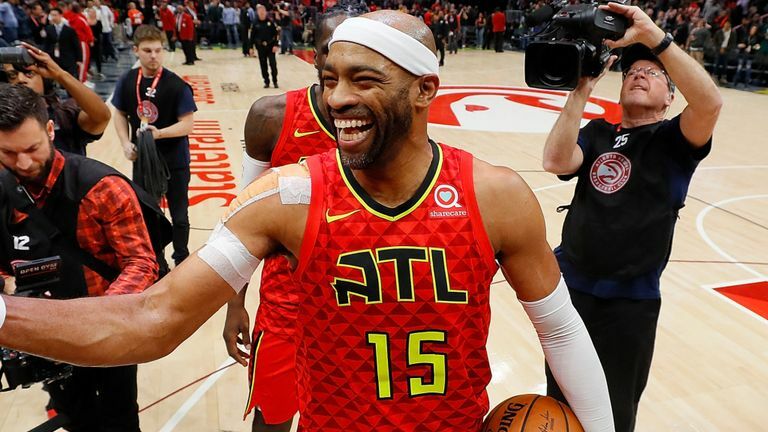 Atlanta Hawks forward Vince Carter continues to prove that he is half man, half amazing. By defying all odds of father time, the 42-year old veteran is still in basketball form. Although his game declines year by year, he has shown that he can still perform with the young guys. This season, Carter averages 7.3 points, 2.5 rebounds and one assist through 69 games. Mostly serving as a mentor to the young-and-coming Hawks, Carter has expressed that he just wants to help the team improve every day. As great of a career that Carter has put together, he is still missing an NBA championship ring. When he came to the Hawks, it was a statement move that he was not worried about putting bling on his finger. Carter will be in the Hall of Fame someday. His careers includes eight All-Star selections, the 1998-99 NBA Rookie of the Year award and top-25 (No. 20) on the league’s all-time scoring list. Also, he has a gold medal from the 2000 Olympic Games. Carter is known primarily for is vicious in-game dunks and flare he added to the sport. He won the 2000 Slam Dunk contest, beating out Steve Francis, Jerry Stackhouse, Ricky Davis, Larry Hughes and Tracy McGrady. Carter was picked No. 5 in the 1998 draft by the Toronto Raptors, where he spent his first six years. He was then moved to the then-New Jersey Nets where he played four years. Since the 2009-10 season, Carter has played for six franchises. Prior to this year, Carter stated that he was “90 something percent” sure that the 2018-2019 would be the closing of his career. He is set to become a free agent and has expressed interest in a potential reunion with the Raptors. Whether its to play or coach, Carter remains optimistic. “It’ll happen one day; it’s supposed to happen,” Carter said to Bleacher Report. Will John ‘The Baptist’ Collins Join the Legacy of Atlanta’s Slam Dunk Contest Champions?